Aerovane Jig is an advanced piece of equipment designed for perfectly fletching and re-fletching vanes and is the only jig that can unleash the full potential of the Firenock Aerovane. Like other Firenock products, Aerovane Jig can be customized with multiple genuine Firenock accessories to fit your needs. Examples of such accessories include the Aerovane Clamp, 9 Chucks, 3 Hooks, the Adjustable Hook, 3-Index, 7-Index, the Production Neck, the Four-Way Adjustable Neck, the Carrying Case, the Laser Alignment Module, the Long Feather Adaptor, the Water Leveler, and more to let you fletch / refletch perfectly, easily, and quickly. With Aerovane Clamp, perfectly straight fletching is made possible. A lot of magnetic based clamps are available for sale on the market, however none of them can satisfy today’s archers with excellent fletching results. In response to this issue, Firenock built Aerovane Clamp. Though initially seemingly similar to other clamps, Aerovane Clamp is actually made of high precision die cast 303 stainless steel and then machined with a straightness of at least 0.001”. For the pivot point, our clamp is installed with zirconia ABEC#5 Ceramic ball bearings for smooth operation, precision, and durability. Compared to other clamps, it is shorter, but this is to fit today’s popular short vanes (as long as 3.7”). Finally, of course, our clamp in the only clamp that fletches Aerovane due to an additional two 1/16” bars machined into its body to grip our vanes by the wind channel at a perfect perpendicular angle. Note : Aerovane Clamp is a straight clamp, and can do offset fletching via a slide hook, but cannot do helical fletch. The four-way adjustable neck allows you to infinitlely re-position while you are using your Aerovane Jig on a coffee table or a workbench and the solid black anodized Aluminum base aims to provide stable operation at home or in the field. In a production environment, the four-way adjustable neck may not be necessary. 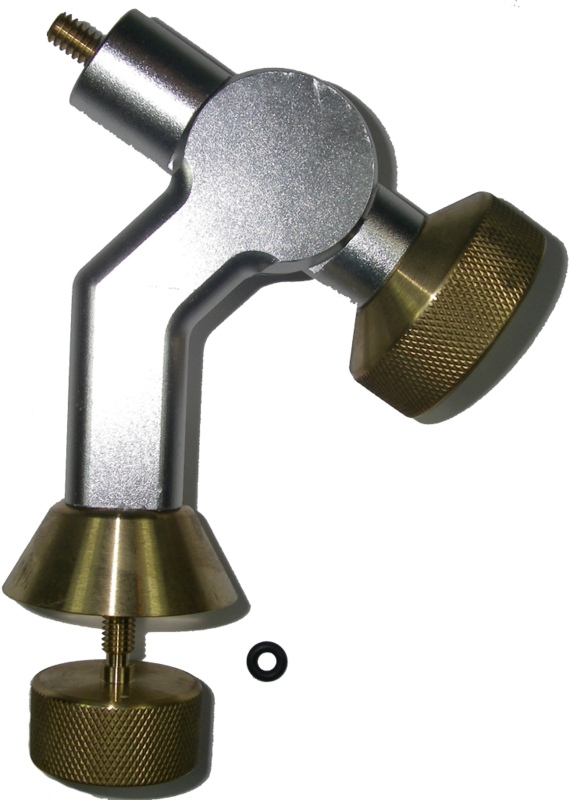 In such cases, Firenock offers a solid 303 machined stainless steel production neck to mount your Aerovane Jig easily onto your worktable or fletching turntable. Developed to re-fletch vanes, this module makes the alignment process effortless. The three-lens optic system emits a straight, thin red laser, allowing you to quickly and efficiently check your entire set up. With just your eyes and this module, you can align your vane, shaft, clamp, and jig with an accuracy up to 1/4-1/16 of a degree. The photo to the left shows the Laser Module mounted on the Aerovane Jig with the straight laser shining through an Aerovane, an arrow shaft, and the jig body's center groove. The Aerovane Jig comes standard with a 3-index installed, allowing one to fletch a 3 vane configuration perfectly. This tool provides index points at 0, 120 and 240 degrees. For those who fletch multiple configurations (2, 3, 4, bowtie 4, & 90 degrees 4), we also offer a 7-index which has index points at 0, 60, 90, 120, 180, 240, and 270 degrees. Note that the 7-index tool must be installed by Firenock LLC. Please contact us here for more information. Firenock Aerovane Jig is designed for use with any of our nine fixed chucks and four hooks (three slide plus one adjustable). To allow the Aerovane Jig to be used with nearly every size of shaft, an interchangeable precision chuck and hook system was developed. All the chucks’ bodies are tapered and precisely machined to ensure zero play between the chuck and index plug. Every chuck pin is made of 303 stainless and equipped with 3 O-rings (except for the pin and nock chucks) to ensure perfect alignment and a solid grip on your arrows. The arrow support hooks are made of aluminum, precision machined, anodized in different colors for easy size identification, and are fitted with ball bearings and brass shoulder bolts for smooth operation and and zero tolerance. Note: All slide hooks can slide to the right to allow an offset of up to 1.5 degree. This design allows you to do offset without the need to adjust the magnet and your offset will still be accurate (+/- 0.25 degree due to eyeballing). Meanwhile, the adjustable hook has laser marking to ensure accurate adjustment. FYI, the offset ability is great for those who shoot slower speed arrows and/or use other vanes besides Aerovane. For protection and ease of use, the Aerovane Jig Carrying Case is made with rip-stop fabric, fitted with water-cut foam and equipped with extra-large zippers. Proudly made in America, the water-cut foam is custom designed to securely hold each and every piece of your Aerovane Jig (plus a bottle of acetone) in its own special place. Double-sided, a zipper allows you to separate the essential components of your Jig (the body, your favorite chuck and hook, etc.) from your other accessories when on the go. In any bow set-up especially using a low viscosity glue (such as the AG0600), a precise water leveler is important. This accessory is our answer to this need. At its core a solid piece of machined aluminum, this leveler is also equipped with four ball bearings and a brass knob. With its open design and ball bearings our leveler will hold on and swing on an arrow smoothly for efficient balance. This adaptor can be attached to the Aerovane Jig to render it able to handle long vanes and feathers up to 5.25 inches. Additionally, of course, it is designed to work with all Aerovane Jig hooks and chucks, making it a perfect companion accessory and good tool for your shop. Have some questions? To the left is a Youtube playlist of all our current Aerovane Jig videos. We hope you'll find your answer in one of them. If not, contact us here.